My hometown Tower Records, on Hillsdale Boulevard in San Mateo, California, shut down for good in November 2006, along with every branch of the nationwide chain. At the time, I wasn’t thinking about the greater ramifications of a physical music chain going under—it was just frustrating to lose the place I most frequently bought albums from. Except on the rare occasions my younger brother and I ventured to Amoeba Music up in San Francisco (a bit of a hike, but worth the trip every time), that Tower Records across the street from the mall was the one-stop shop for music purchases. It had a much wider and eclectic selection than the big-box places like Best Buy or Borders, which didn’t focus mainly on music. And unlike those other stores, which only prominently displayed Top 40, the Tower staff recommendations occasionally illuminated a few gems. One day in the summer of 2004, I wandered over to the listening stations and put on a pair of headphones to sample some of the six albums sat in the Staff Recommendation spots. Today, with thousands of music blogs and exclusive track debuts streaming in every corner of the Internet, the listening booth is a piece of antiquity. Seeing someone use a new digital sampling station is like watching someone attempt to operate a dot matrix printer: Sure, the technology still exists, but it has been rendered woefully obsolete. That day, an album with a guitarist and a bassist on a stark white cover caught my eye, three pictures of each musician rocking out and layered over one another, with Ratatat stamped across the bottom. The beginning of “Seventeen Years” initially hides what’s about to follow—40-plus minutes of dense waves of layered guitars cascading over drum machines. It starts innocuously, with a spoken-word intro from a rapper boasting how years of experience have made him an expert freestyler. (“I’ve been rapping for about 17 years, okay? I don’t write my stuff anymore I just kick it from my head, you know what I’m saying? I can do that. No disrespect, but that’s how I am.”) That bit of winking misdirection hides the sneak attack that pounces after 10 seconds, a kick in the teeth from a distorted power chord that clears space for the first bouncing guitar line. Four measures later, a harmony line kicks in, and the three guitar parts snake together until a minute later, two more pile on. By the time the pyrotechnics run out and the track mellows in the final third, it’s like an ice pack to the back of the neck after a wind sprint. After that four and a half minute sample, I bought the record. Producer Evan Mast and guitarist Mike Stroud initially met as students at Skidmore College, but they didn’t start working together until 2001 in New York City. Stroud was playing as a touring guitarist for Dashboard Confessional (he went to a last-minute audition the day before a tour departed, then hated the gig), and later Ben Kweller. Mast, who at the time produced ambient music on his laptop as E*vax, had co-founded Portland independent label Audio Dregs with his brother Eric, a.k.a. E*rock, in 1996. When Stroud wasn’t busy touring, and Mast wasn’t occupied by graphic design work, the two began collaborating under the name Cherry. Mast worked on ideas from the bedroom of his Crown Heights apartment, constructing beats in Logic and GarageBand, and then handing off to Stroud to develop. The back-and-forth added dense layers of guitars, played through distortion pedals, loops over loops to create instrumental tracks. One of the duo’s favorite tricks was to play a chord progression backward, and then reverse the recording to achieve the desired distorted effect. (“El Pico” is a prime example.) After changing the duo’s name from Cherry to Ratatat, first single “Seventeen Years” debuted on Audio Dregs, earning the group gigs supporting Interpol, Franz Ferdinand, and Battles, followed shortly thereafter by a record deal with XL Records to put out the rest of the songs the duo had put together over two years of work. I’m fairly certain that when I bought Ratatat a couple months after its release, it was the last physical purchase I made in a record store based on that kind of unexpected recommendation. It’s also the album I most closely associate with my rapid transition from using only physical media like CDs and CD players (usually clipped to my belt while biking back and forth from Blockbuster) to navigating all my music via a computer and an iPod. In April 2003, the iTunes Store debuted, and in October of that year, iTunes added support for Windows operating systems, meaning I could join the millions of people compiling fledgling digital libraries. (I had Napster and Winamp, but iTunes was the watershed moment for digital music library organization.) I still purchased CDs, because I love liner notes and cover art, but the focus shifted from lugging around massive cases on road trips or vacations to simply storing the physical item and condensing everything into an iPod. What still feels strange about linking that time and Ratatat in my memory is that the album doesn’t neatly fall within what would typically be classified as electronic music. The true “bedroom album” is Mast’s debut under his E*Vax moniker, 2001’s Parking Lot Music, which carries strains of Aphex Twin in its DNA that could later be found in the work of someone like Baths. But despite layer upon layer of soaring guitars—Stroud cited Jimmy Page (among others) as a big influence on his playing style—it’s definitely not rock, either. The instrumental style veers toward IDM (as opposed to the instrumental post-rock of bands like Explosions In The Sky), and the distorted guitars contain tinges of chiptune (especially the bounciness of what might be considered the chorus on “Crips”), with gleefully unhinged bits of hair metal thrown in at the most manic junctures. Some reviewers at the time approximated the duo as a smaller-sounding Daft Punk, which still feels slightly misleading, considering the downtempo style of Ratatat’s debut isn’t explicitly geared toward dancing—at least not the kind seen in the throngs crowding in front of a glowing pyramid. If anything, judging from live performance—which has always been a daunting task to work out, since the duo records without thinking of how to achieve the same swirling, multi-tracked effects onstage—it’s headbanging music with brief reprieves. And then there are the spoken-word segments that resemble tiny, unnecessary skits, one of the most obvious signifiers of hip-hop influence. Though none of the songs have lyrics or vocals, a few tracks begin or end with snippets of dialogue, courtesy of voicemails from Young Churf, a rapper Mast and Stroud knew from around Crown Heights. (That’s him with the album opening boast, though he serves as an unknowing hype-man at the end of “El Pico,” “Bustelo,” and “Germany To Germany.”) Incorporating a few vocal samples became a Ratatat staple. Classics features a prominent sample of a large cat on “Wildcat,” while LP4 samples Werner Herzog’s Stroszek and actress Linda Manz, best known for her role in Terrence Malick’s Days Of Heaven. All of these elements in the same record give the impression of obsessive tinkerers progressively adding everything but the kitchen sink. A few funny voicemails here, a punching power chord there, a couple extra backward guitar loops, and voilà—the puzzle is complete. Ratatat is an illogically overstuffed suite with an embarrassment of riches, carefully constructed so as not to destroy a delicately arranged compound—like one of the manmade elements high up on the periodic table that only needs to exist for a few milliseconds to be counted—only this one stays together. In Scott Pilgrim Vs. The World, high-schooler Knives Chau comically bemoans her inability to win back her beloved, Scott, from Ramona Flowers, crying, “I didn’t even know there was good music until, like, two months ago!” While I’d heard some individual electronic songs, Ratatat was the first album to make me sit up and take notice of an entire genre I had been taking for granted and how much I thought I was missing through this lack of knowledge. But countless producers and electronic acts later, Ratatat still occupies a spot on the genre spectrum that feels set apart from anything else. The guitar distortion places it at odds with IDM. The head-nodding beats signify hip-hop but lack vocals, leaving songs more open to interpretation as atmosphere. The duo went on to produce for Kid Cudi, among others, but not to the point of contemporary mash-up artists like Girl Talk. And the synth rock acts like MGMT and Passion Pit, or Skrillex’s rib-rattling dubstep, a dominant cornerstone of DJ acts in EDM, weren’t even on the horizon yet. Ratatat uses a song framework similar to the build-and-drop that has become so common in electronic music, but the extremes are much closer together. “Seventeen Years” builds consistently before turning sharply into a more relaxed mood. The album’s other single, “Germany To Germany,” has the next-most infectious riff on the record, but cools off in the middle, dropping the heavy distortion while leaving a soothing texture. The main guitar line on “Lapland” employs a shimmery staccato ripple effect only underlines that progression. Ratatat unfolds like the ebb and flow of a tide, slowing rising to a critical mass, then receding again before fading out and moving on to the next movement. No song illustrates that quite like album closer “Cherry,” named for the band’s former handle. It’s a hazy and passionate track that slowly builds, employing sliding guitar lines instead of chugging distortion, before dropping to a whisper then kicking to a high point that fades out over the final two minutes. On an album that links together tone pieces that nearly burst with energy, “Cherry” is a stunningly romantic little world. (Bizarrely, the music video, designed by Mast’s brother, looks like a Rorschach test on acid.) Eventually, an astute filmmaker will use it as the soundtrack to a smoldering dance scene. Ratatat followed its debut with another solid and memorable album, Classics, and then on LP3 and LP4 (compiled from songs produced in the same sessions) branched out slightly by adding live strings for the first time. As a solo act, E*Vax has gone on to further production work, including Jay Z’s “100$ Bill” from the soundtrack for Baz Luhrmann’s adaptation of The Great Gatsby. But the duo hasn’t put out a new record in four years, though a new album is reportedly on the docket for this year. Odds point to it being titled LP5, though that wouldn’t bode well for a rejuvenating shot in the arm, given the diminishing returns of the previous two albums. 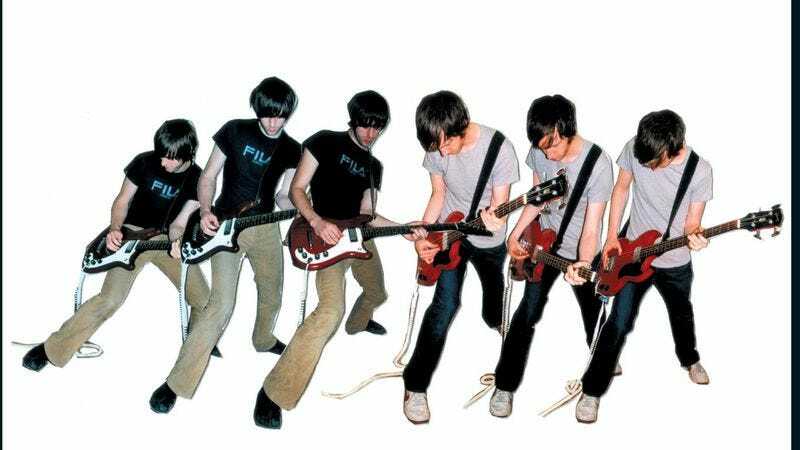 What was a surprisingly singular novelty in 2004 is now one of many cacophonous voices under the ever-widening electronic genre umbrella. The last time I accidentally landed on Ratatat while shuffling through my iPod was on a train from Prague to Berlin with my younger brother. And though it felt oddly appropriate to be listening to “Germany To Germany” on the way to a city where we could actually walk along the wall between the formerly split nation, I couldn’t help but think about that Tower Records at Hillsdale. Some records conjure up feelings of a person, while others engender memories of a specific place. Ratatat is an album that merits strong associations, and it never fails to remind me of putting on those ratty listening station headphones, with the gnarled cord and worn-out leather ear pads, and pressing play for the first time. American Dad: “News Glance With Genevieve Vavance"